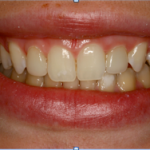 This patient was a teenager referred to us by her orthodontist as she neared the end of her orthodontic treatment. She was missing one maxillary lateral incisor, and had a malformed adult tooth on the other side. 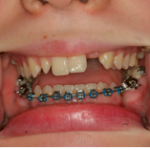 She had a false tooth in place during the orthodontics. 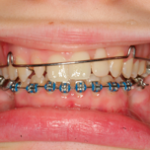 We worked with the referring orthodontist to ensure a successful outcome. Once the teeth were straight, we gave her two natural-looking implants just in time for prom night!